Egypt’s armed forces are refraining from military threats over a River Nile dam dispute, with a spokesperson for the general staff declaring that it “is not a military issue at this stage,” following some heated exchanges between the two countries. 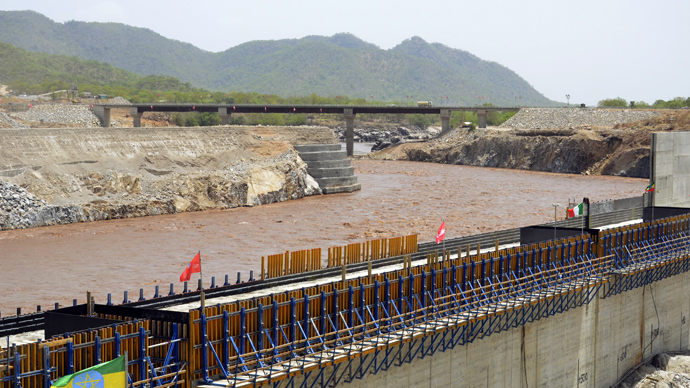 Tensions have heightened over a giant dam on the Nile, termed the “Great Renaissance Dam” by Ethiopia. Egypt fears that the new hydroelectric plant will deplete its vital water resources. “It's too early to involve the army in this problem at the moment,” Ahmed Mohamed Ali told Reuters. Egyptian President Mohamed Mursi said earlier on Monday that he did not want war but would keep “all options open,” inciting a response from Ethiopia. Last week, some Egyptian politicians were recorded discussing potential air strikes or the possibility of offering support to Ethiopian rebels. Egypt’s foreign minister will travel to Ethiopia on Sunday to discuss the subject of the dam further, despite Ethiopia’s declaration that it would not be accepting any proposals to temporarily halt construction. The rights of priority to the Nile’s water supply are backed by colonial-era treaties, according to Egypt. The river provides the majority of the county’s 84 million residents with water. Ethiopia states that this attitude is outdated and that it cannot stay under-provided for. “It would be important to just have discussions that are open, that look at how we can have a win-win situation in a new context, not in the context of the colonial powers, but in the context of pan-Africanism and African renaissance,” the African Union's Nkosazana Dlamini-Zuma stated in a press conference.